This is a project that has been finished for a little while now, but it had some finalizing details to get everything put together and make it work well. Overall time on it was about 3 months, and we took around 3 days filming it. I think our end results turned out very well for having a budget of precisely zero dollars to put this together. Filming was done on a SLR camera, in 720p resolution. The overall goal was to put together a small promotional video for the Doro I train at in the Detroit area, the Martial Science Center. The Iaido group here is Takumakan and specifically is Toyama Ryu or for those that aren’t in the know… the style taught to Japanese military officers. There is probably one in the future coming for Jujitsu, but I hope it’s not too soon as this really took some effort. 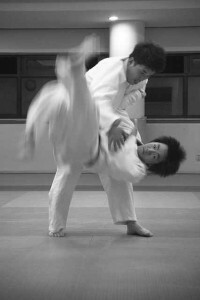 All to often in martial training one is given a generalized target to work with such as the head, torso, outer leg, etc. While at a basic level this approach acceptable in order to further our training we need to proceed further. Rather then generalizing, we need to be thinking head for instance.. we need to be thinking nose, left orbital, left temple.. base of jaw. The study goes further than that however.. there are a lot of additional components. Intended effect and reaction, type of strike, angle of attack and knowing what surrounds your target is equally important. Specific targets are aimed at within the body for specific effect. I’m not talking about the obvious such as simply poking someone in the eye. What happens when the hips are displaced backwards from a low punch, or then the a leg is driven outward from a strike? Where does the body move and what openings does it produce? Study of body movement in such cases are important because it guides what your follow up strikes are going to be.. and equally important where they are not going to be based on your expected reaction. All martial training has a wide variety of focus. You are always looking to extend your technique and build in muscle memory so that your actions may be seamless. Other times, we are looking to improve balance,distancing, power, speed or response time. In this particular case however, we are looking at 2 specific factors, cardio training and conditioning. How much of these can you fit in and are you under or over training these facets given your available time to work with? Cardio work is a matter of training the heart, lungs and muscles to work more efficiently in either aerobic or anaerobic conditions.. depending on what you may need to function in. The bottom line is that you are able to perform longer and under less stress in either of the environments. Conditioning the training of the body to deliver and accept strikes. Just as the bones and muscles grow stronger in weightlifting, in conditioning the body adapts by strengthening them in a similar fashion. Calcium deposits begin to form blocking and striking surfaces, further reinforcing them. There is an old saying of “Would you rather fight a poor fighter in excellent condition, or an excellent fighter in poor condition?” The answer is almost always unanimously the latter… however these are considering engagements that take a while to resolve themselves. Engagements such as boxing, kickboxing and mixed martial arts. Yes, they can be resolved in one punch but the expectation needs to be that the opponent is going to be in it for the long haul, as your techniques and gear degrades the fight for a level of “safety,” whatever that tolerance may be. When we examine fights on the street however, you need to be able to function maximally and clearly for a short period of time. The level of expectation between the 2 is vastly different. I am of the general opinion that it is impossible to train too much cardio… given that you have all the time in the world to practice. Cardio has no real negative effects with the exception of taking up time to do. I think it is something that is best incorporated into training and drills when possible but using as much time as possible with partners to work on technique. No or little cardio is likewise devastating is it prevents you from working efficiently in any sort of engagement. Becoming winded in 15 seconds is terrible. Over Conditioning however is somewhat of a more permanent problem. Too much calcification prevents joints from functioning properly or arthritically, not to mention is unattractive to boot. The body has the bad habit of not showing repetitive stress fractures until years later. Those with little or no conditioning will function fine… as long as they are training with similarly conditioned fellows. Put them in with someone who is used to impact and training hard and suddenly they are in a world of hurt. The point of this isn’t specifically to point out how much is too much, but rather that you examine how your time is used to train and what is incorporated in it in order to get the most effective use of your time. These last 2 weeks have been an absolute terror as far as random work, travel and regular work on Tuesday and Thursday. As I’d have to leave you completely hanging however.. here is something from a friend of mine, Don Alley who has just started writing for the examiners Detroit edition. He’s got a very nice article on self improvement, so go check it out. One of the more universal concepts within martial arts is the control of the center of the engagement. This makes natural sense as when the opponent is within range, so are you. If not immediately, you are within a step of being potentially in trouble. As the shortest path between 2 points is a straight line, controlling the center of an engagement becomes paramount. As with nearly everything however, we have to apply the rule of threes to this. Controlling your center as well as controlling the center of the opponent equally important. As for controlling the center of an engagement… there are 2 ways this can be accomplished; directly and indirectly. The direct method is to have something in between you and your opponent be it an arm or a weapon. This prevents your opponents from simply closing without consequences and allows you the opportunity to check and parry. 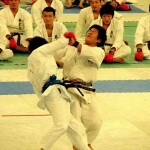 It also allows you to have a simple method of attacking as well through thrusting and striking. The indirect method is perhaps more interesting, command of the center is simply “implied” rather than having it physically controlled. This is accomplished by having a weapon ready to strike or otherwise being able to punish your opponent for attempting to take it. Indirect control is particularly useful in the case of blunt weaponry where you don’t necessarily want it grabbed and taken away from you. Controlling your center is important for a large variety of reasons. The first of which is that it gives you a consistant set Ma-ai for percussion as well as allowing you to be rooted when you do so. Secondly, a good center will allow you to maintain a good neutral posture which has no tells in your movement… very important or an opponent will exploit these. Lastly, maintaining that center makes it much more difficult to throw you or otherwise use controlling techniques. Controlling your opponents center has a number of good applications as well… most of which are listed above however I’ll reiterate them for emphasis. An off centered opponent is far easier to throw, control or sweep. Good application of technique will off center them rather easily. Their movement will also be considerably more predictable, as moving to the off centered sides is far slower as a weight lowering and then shift is necessary to accomplish the task. In the case that they are forward, their techniques will lack speed, power or the proper distance to do the damage that’s required of them. There is a number of ways to achieve this; successfully attacking either of the legs is one of the simpler ones.. as properly applied control will take them out of the fight immediately. Control of all of these can be accomplished through training proper technique diligently. That same technique is applicable across all systems, so it is important to get it right and into muscle memory so it can be easily applied. Despite the obvious overview of the title this post isn’t about any sort of contest between the 2 whatsoever. Rather its an examination of the styles and methodology of martial study. In that regard, the title is very limiting and should be expanded upon greatly to include probably more titles perhaps than I could fit into this article. This has a fair amount of bleed over into the reasons for training martial arts (and there are indeed many.) so I am going to try and separate the two as much as possible. The reason for this of course is because different training styles attract various personality styles and along with them, motivations. Someone might ultimately be unsatisfied with the practical effectiveness of their training and move away from a Do style to a Jitsu. The reverse is equally as likely as one searches for a meaning in their training beyond taking people apart. All styles have this crossover, as well as a spiritual aspect and one of self improvement. Although I list terms in Japanese, it shouldn’t be too difficult to break your methodology apart if you look at it. With that out of the way we can being to look closer to the heart of the matter; artist versus scientist. Of the original study there was no “art” in martial arts at all. It was purely a military study of defeating ones opponents using the best technology available at the time. Fists, Sticks and Swords have now been supplanted for the most part by firearms and explosives. The former is still used, but it’s highly situation ally specific. The martial artist is interested in the study of martial arts primarily for the “art” of the study. The techniques need to look good as well as be effective within their intended scope of their application (Note I did not say this was ineffective, just slanted towards what the scope is.) Technique is there, however the original intent and depth of the technique is reinvented from its original purpose. Compartmentalization occurs between the trinity rather than looking at the similarities. The martial scientist on the other hand is looking for the connection and application between the techniques. Biomechanics, leverage, momentum, mindset, distancing all carry between the triangle of grappling, percussion and weaponry. The martial scientist seeks to exploit the familiarities between these to a point where no thinking is required. The motion is familiar enough in muscle memory to the point where it simply occurs with predictable results. I can’t say that martial scientists were the “original” martial artists because that approach wasn’t taken until later in Japanese history and a good amount of European teaching was non standardized until later as well. The concern for effectiveness was most likely there over modularity. Modern martial “arts” in many cases are far from the original and is something that needs to be rediscovered to encourage the original effectiveness. Where does your training fall within the spectrum? Of the 3 pure combat skill sets that a fighter possesses (Grappling, Percussion and Weaponry) grappling seems to be getting a lot of attention nowadays. A basic level of attention needs to be given to everything to make a well rounded fighter at least from the standpoint of having a defense against it. Nobody wants to be picked apart by jabs, cut up by weaponry or pinned by something simple just because they’re entirely unfamiliar with it. In a self defense situation it can easily mean your life hangs in the balance. In this case I list grappling separate from combat grappling because even though they share the same skill set, their application is quite a bit different. Grappling as a study itself is very interesting; it’s essentially the study of kinesiology. How a body moves and equally important, how a body does not move. What are the limitations of the joints, what are the limitations of the musculature, circulatory and nervous systems. A lot has been made of the famed Japanese sword - the katana. I think a lot of it is in conjunction with ninjas; hyping the weapon up from the mere improbable into the impossible. As we all know from movies the sword is unbreakable, can cut through nearly anything and periodically enable the user to fly or other oddities. This is of course pure hogwash. Drawing – The katana itself is efficient shaped for a speedy draw. The weapons curvature enables some of the length to wrap around the body and to use the bodies natural arcs to draw. Typically carried edge up, with considerable training the draw is extremely quick and can be used to deliver an effective cut. Along with this worth noting that this cut likely won’t cleaving anyone in half, as it lacks the mechanical leverage to do so. Despite this, the weapon is still more than capable of removing the operators hand on the draw, or inflicting other serious injury on sheathing (noto) the weapon. Also worth noting is that with the proper draw most westerners can use a considerably longer weapon than the standard lengths.. training with this is obviously required due to the above mention. Cutting ability – Katanas have a fantastic cleaving ability through tissue and most softer materials. This is again, because of the blades geometry. The natural movement of the arms combined with the blades curve provide and extremely efficient cutting method easily capable of cleaving bodies in half provided that proper leverage is used, 2 hands. The blades tip is quite sturdy and can also deliver an effective thrust. Proper training enables the usage of this to penetrate armor gaps and enter softer targets within the body. Blade Breakage – Far from being impervious katanas in traditional literature break frequently. The result of this is usually the death of the user in question. This is due to the teardrop shaped blade geometry, it is a minimalist design that is specialized in cleaving. Striking harder materials such as plated armor and other metal objects (swords in particular) remain a significant impediment and can result in blade breakage even in the case that the object is penetrated. The blades are still quite tough in the proper hands and it is worth noting that older blades consist of a more teardrop shape resulting in less overall sharpness but considerably increased resilience over the nice flat modern blades, which are shaped to cut tissue and mats. Some of the more modern complaints about the weapon are due to this. Overall the weapon is an effecient design that is well matched to the Kenjitsu style of swordsmanship. The blade sacrifices some integrity for weight versus european swords as well as maintains a considerably different balance. Typically the ideal spacing is the one that the tool can be used to strike effectively and still retain as much distance as possible. Too far away and the attack will miss entirely, leaving the attacker very vulnerable to a counter. Too close and you are failing to utilize the characteristics of whatever tool you intend to use, the tools reach. Being able to strike your opponent due to reach and have them unable to counter without some serious movement is an ideal situation to be in. Beyond striking with the ideal surfaces of the body or weapon, there is another practical reason to maintain proper distancing. The human body can only respond to external stimulus so quickly (an incoming punch, kick or weapon.) This is know as the “reactionary gap” and for most people is somewhere around .25 to .30 seconds. This gap will preserve you or get you killed as quickly as anything. In the case of a percussive engagement, striking and checking (Blocking) is going to most likely occur at the same time. This is a necessary trade off due to the length of limbs.. and due to the reactionary gap, you are most likely going to get hit unless you can end an engagement as soon as it starts. Getting hit with fists and feet is OK though (a necessary evil perhaps,) they are mostly survive-able as long as one doesn’t take too much of a beating. When a weapon is brought into play however; the game changes dramatically. One well placed strike is either lethal or debilitating enough to lead to one’s demise. Even a poorly placed strike can have similar effects depending on pain tolerance and the strikes location. In this case maintaining the proper distance means you’ll ideally be able to connect with minimal exposure to yourself (The attacker has the same gap as the defender) or be able respond and counter, ending the engagement in your favor. Mae is something that some people are far better at than others (I’m probably in the middle of the group.) but fortunately it is a refine-able talent with practice. Knowing your distances will definitely save you some pain, and it might just save your life. With a tremendous amount of martial arts available now, the art is becoming progressively more and more specialized. Some only grapple, some strike, some only like weapons and similar. To be a really balanced martial artist one needs to have at least a fundamental understanding in all 3 areas. Weaponry commonly gets lost nowadays, simply because of the mistaken belief that it’s “not applicable” in a modern world because traditional weapons simply aren’t used anymore. Nothing could possibly be further from the truth! In addition to that, you are robbing yourself of a knowledge set involved in any forms you might happen to perform. We can start by simply looking at the name “Martial art.” It evokes images of Bruce Lee, Chuck Norris, Jackie Chan, Jet Li and the like. Martial’s meaning of course, is Military. Military Art. Were fists and feet used in Militaries? Absolutely, as a backup. You used them when Your spear was broken, your sword was bent, and the dagger you were carrying was left in a body 5 guys ago and his club is now broken. Simply put they’re a weapon of last resort after your real ordinance is expended or situationally used opportunistically. Were that not the case, we’d never have evolved beyond using our bare bodies. So, why practice forms that use fists and feet then? It’s not purely that!